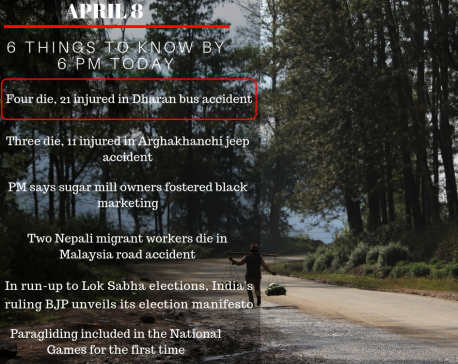 DHARAN, April 13: Three people killed and 9 sustained injuries in a car-bus collision in Dharan on Friday night. The accident took place when a car (Ba 20 Cha 4076) attempted to overtake a tractor (Me 1 Ta 6692) and collided head-on with a bus (Ko 1 Kha 4761) at Panitanki of Dharan sub-metropolitan city-8. According to DSP Gyanendra Phuyal, the deceased have been identified as Anil Shrestha of Itahari, Janak Budhathoki of Dhankuta and Madan Limbu, who were travelling in the car. Car driver Govinda Basnet, who was severely injured. is undergoing treatment at the Biratnagar Hospital. Three people in the tractor and five people travelling in the bus had sustained injuries. They are receiving treatment in Dharan-based hospital.